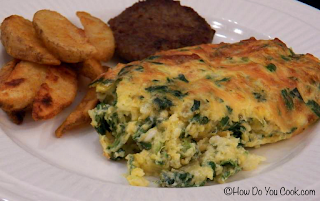 Crustless quiche or egg casserole? Regardless of the name, this fluffy egg dish with a mild green chili and spinach filling makes a delicious breakfast or brunch, or in this case a great weeknight meal. Since most mornings we are way too busy to fix a "fancy" meal, serving breakfast for dinner is something our family has always enjoyed. Eggs are a great comfort food and they are also an inexpensive way to feed a family. Plus with this dish, you'll even have leftovers for a quick breakfast. Preheat oven to 425 degrees. Melt butter in a glass 13 x 9 inch baking dish and set aside. In a large bowl beat the eggs until blended, then add all of the remaining ingredients and stir until combined. Pour the mixture into the baking dish and bake for 25 - 35 minutes or until golden on top and the center is set. Serve with salsa, sour cream or hot sauce, a side of roasted potatoes and your favorite sausage or bacon. Makes 8 servings. Enjoy! !